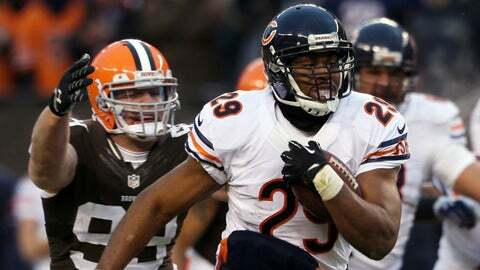 Chicago Bears running back Michael Bush (29) gets away from Cleveland Browns cornerback Leon McFadden (29) to score a touchdown during the fourth quarter at FirstEnergy Stadium. CLEVELAND (AP) — Before he returned to the field, Jay Cutler had to make sure his teammates wanted him back. Chicago’s starting quarterback knew there might be some resistance to him replacing Josh McCown, who had played so well while Cutler was out four games with a sprained ankle. So Cutler talked to wide receiver Brandon Marshall. He spoke with running back Matt Forte and then met with his offensive linemen. They all told Cutler he was their man. Everyone was all-in on it and I appreciate it. And Sunday they made him believe it. "They didn’t flinch," Cutler said. "They were like, `You’re our guy. Glad to have you back.’ And they played like it." Cutler overcame a rusty start by throwing three touchdown passes Sunday, rallying the Bears to a 38-31 win over the Cleveland Browns, who dropped their fifth straight game despite scoring a pair of defensive TDs in their home finale. Earlier this week, Bears coach Marc Trestman stuck to his plan to start Cutler once he was healthy even though McCown had led the Bears (8-6) to wins the previous two weeks and was playing as well as any quarterback in the league. Trestman’s decision didn’t get unanimous approval and led to reports that Chicago’s locker was split into pro-Cutler and pro-McCown camps. But on a cold day in Cleveland, the Bears were united. "Everyone was all-in on it and I appreciate it," said Cutler, who threw two interceptions in the first half. "The guys rallied around me." Trestman praised his team for blocking out distractions and taking care of business to keep its NFC playoff hopes moving forward. "There was a lot of noise around our team this week," Trestman said. "They hung together." Cutler threw a 4-yard TD pass in the fourth quarter to Earl Bennett to give the Bears a 31-24 lead, and Michael Bush’s 40-yard TD run with 2:17 left put Chicago up by 14. The Browns (4-10) got a late touchdown pass from Jason Campbell to Josh Gordon to get within seven, but Cleveland, which lost a heartbreaker last week in New England when it couldn’t recover an onside kick in the final minute, was called for an illegal formation trying one of its own and the Bears ran out the clock. A month ago, the Browns were on the edge of the playoff picture. Cleveland has not only fallen off, but seen a season of promise disintegrate again. The Browns, who have blown late leads in their last three losses, have lost at least 10 games the past six seasons. Here are five things we learned as Chicago moved temporarily into first place in the NFC North. HADEN’S HIP: The Browns lost star cornerback Joe Haden with a hip pointer in the second half. Haden’s absence allowed Cutler to pick on Cleveland’s less experienced defensive backs, a key in Chicago’s comeback. Haden is having a Pro Bowl-caliber season, but he has been burned on big plays in the past few weeks and his injury could put any possible trip to Hawaii in jeopardy. MARSHALL PLAN: Marshall was Cutler’s intended target on the two first-half picks. Chicago Bears running back Michael Bush (29) runs away from Cleveland Browns outside linebacker Paul Kruger (99) for a touchdown during the fourth quarter at FirstEnergy Stadium. The Bears won 38-31. Both throws were intercepted by Browns safety Tashaun Gipson, who returned the second one 44 yards for a TD to put the Browns ahead 10-3. Marshall took blame for the first miscue. "The second one, he just threw a terrible ball, so that’s on Jay," Marshall joked as Cutler stood nearby smiling in the interview room. GORDON GROUNDED: Gordon finally looked mortal. After having the best four-game statistical stretch by any receiver in NFL history, Gordon had a pedestrian performance with three catches for 67 yards. In his previous four games, Gordon totaled 774 yards receiving with five touchdowns, jaw-dropping highlights and a handful of team and league records. "There could have been more plays made," said Gordon, who was involved in a minor traffic accident on Saturday. "I feel that way, but that’s just every game, there were a few more plays we could have made and wins we could have had. It’s just unfortunate." UP FOR GRABS: Cutler’s second TD pass could have easily been his third interception. With the Browns leading 24-17 early in the fourth, Cutler heaved a 45-yard pass toward the end zone as he was hit by Cleveland’s Jabaal Sheard. The ball hung in the air, got pushed around in the blustery conditions and Bears wide receiver Alshon Jeffery was able to outfight Gipson and defensive back Julien Posey for the TD. "My arm got hit, so I didn’t think it was going to get there," Cutler said. "I was on the ground, and I was like, `There’s (interception) No. 3,’ because I just thought it was going to float 20 yards down the field. Somehow it got all the way down there and Alshon does what Alshon does best." DIVISION CHAMPS: While taking a one-half game lead over idle Detroit in the NFC North, the Bears completed a four-game sweep of the AFC North. Chicago beat Cincinnati, Pittsburgh, Baltimore and Cleveland this season. The Bears visit Philadelphia next week.